Brow Artist Genius Kit is the ultimate all-in-one brow kit. The kit contains a styling wax, a tinted powder, an angled brush, a spooled brush and a unique set of tweezers. The pigmented wax holds for 12 hours and the natural shaded powder allows for buildable colour. Made to measure eyebrows for whichever look you are going for: natural, defined or graphic. The result: Defined and fuller looking brows. Long wear. Great product! It is easy to apply, long wearing, and it has good value. I can make natural or deeper look with this. I prefer cake powder over pencil. HOLY GRAIL BROW PRODUCT. I have completely fallen for this little palette in its classy metal casing. The powder and wax duo are the perfect product for the “my brows but better” look. The dark brown shade matches my coloring perfectly and is super quick and easy to apply. The little tweezers that come with it are super good, I didn’t have high hopes for them but I was pleasantly surprised. The angled brush and spoolie are alright, I would preferably like to have a full sized spoolie and angled brush but I’ve been lazy and broke and the mini sized one is fine. The product is really fairly priced and it seems like it’s going to take me ages to finish it – and I’ve been using it daily for the last 8 months. I definitely recommend this product. 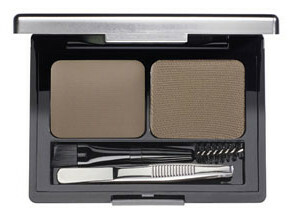 This brow kit’s formula is definitely good quality; it is highly pigmented and very useful if you’re on the go. It is a silver finished compact and mirror, with mini tweezers and a two sided spooled and angled brush. Again; so convenient for traveling.